Born to Flemish parents who had settled in Madrid, Juan van der Hamen y Leon, master of Spanish still life painting, remains one of the principal members of the first Spanish naturalism. He certainly knew the work of the Carthusian painter Juan Sanchez Cotan (1560-1627) and works by Italian artists post Caravaggio. In fact, he is documented in 1617 in Madrid of with painters like Bartolomeo Cavarozzi (1586 Viterbo - Rome 1625), Giovanni Battista Crescenzi (Rome 1577 - Madrid 1635) and Pier Paolo Bonzi (1576 - 1636) many of whose works were in the Spanish collections. 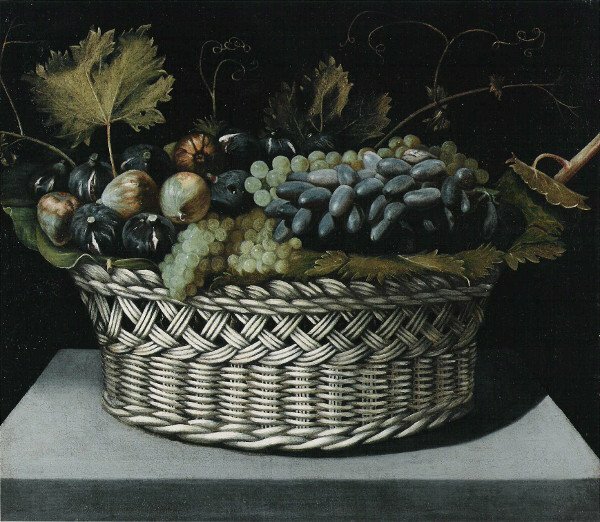 These beautiful bodegones (still life paintings) that are present in the exhibition are an example of the firm and almost ritual conception that the Spanish still life painter possessed, both in respect to Flemish and Italian culture with a resumption of Caravaggio's style. The arrangement of the elements adheres to a strict geometric form that gives the paintings a certain monumentality plasticity. Grapes, figs, cherries, apples and beans, though humble elements of nature, here acquire mystical allusions of an almost sacred dignity.